As part of The Telegraph’s Business Reporter Studio Debates series, Alastair Greener interviews encompass co-founder Wayne Johnson about his insights into where he sees the future of banking. Whatever the thoughts of banks on the compliance regulations being passed at intergovernmental level, what is clear is that these changes are a “given, you have to do it” says encompass co-founder, Wayne Johnson. The regulations implemented by the Financial Action Task Force, due to be strengthened this year with the impending 2017 Money Laundering Regulations, has given an opportunity to new companies working in the FinTech and RegTech sector to work with banks on their compliance measures, to help ensure they are compliant and provide better customer service. The need for banks and financial institutions to be be more scrupulous in their onboarding practices has been exacerbated by external pressures from customers. Customers in 2017 are demanding that banks be more transparent and customer-focused when applications are made to purchase their products or services. Leaving extended periods of time while customer onboarding processes (known as “Know Your Customer” or “KYC”) are completed is not acceptable, regardless of the weight of regulations falling on to banking institutions. Customers expect to see increased levels of transparency from those who hold their personal details, and in whom they place both their trust and their finances. The dual pressures of customer expectation for a fast and agile onboarding process, alongside the need to meet regulatory requirements mean that banks need to increase the sophistication of their onboarding services. The rise in customer expectation has risen in tandem with the complexity of compliance regulations, which has added to their burden. There is a further recognition that banks and financial institutions, while holding a vast quantity of data themselves, need to verify this data; or acquire new sources of information. This is most commonly done through trusted providers such as Experian, Companies House and Dun & Bradstreet. “Compliance is often about making important informed decisions, using the data that’s there in the system together with what’s externally available to be able to make that decision. And that often means tying the knots together, making sure it lines up, and identifying the key elements that you need to make that important decision” says Johnson. One method of ensuring that compliance needs are met while cutting costs and time is through the use of automation. KYC processes which may have taken months can now be completed by specialised software in a matter of minutes. This software cuts down the onboarding process from days and weeks to hours and minutes. The time taken between initial contact and the point where banks can begin selling in products and services is greatly reduced, as is the volume of touch points with the customer prior to onboarding being complete. Another major benefit of using the technologies RegTech companies offer is they mitigate the risk of manual error in the equation. Where the same process is repeated many times by an individual, there is the opportunity for steps to be missed, or for manual error to occur. Automated software greatly reduces the chance of human error, and leaves a clear audit trail that can be revisited at any time. Software can minimise costs, and allow banks and financial services companies to focus their resources where they are most required. “It allows them to take their own policy with the data service they are familiar using, and automate those steps. In other words not doing them manually any longer, but allowing the system to automatically gather, select and link information and visually show the output to you, to allow a specialist to make a decision” said Johnson. Increased levels of compliance regulation allied to enhanced expectations from customers are placing pressures on banks to have have processes in place for a thorough and swift onboarding process for new customers. Through the use of automation, banks can remedy these pressures, ensuring they are compliant, can produce an audit trail and reduce the onboarding time for new customers to mere hours. At encompass we believe the best decisions are made when we understand the full picture. 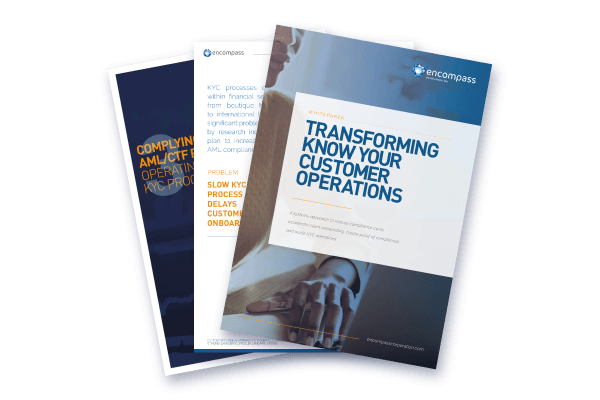 Our KYC automation solutions – encompass confirm for banking and finance, and encompass verify for legal and accountancy – utilise trusted data sources, data automation and visualisation, and auditability to ensure that your business regulator ready.